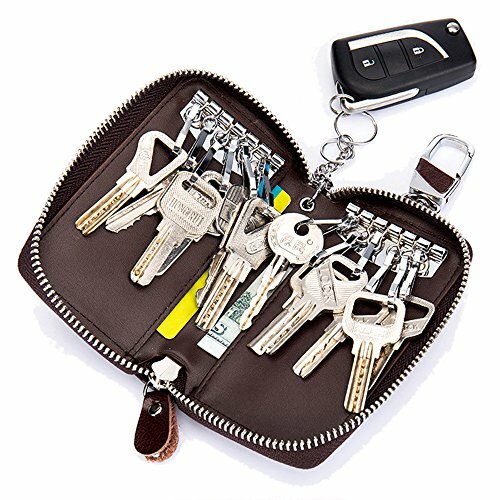 Aladin Large Leather Key Case Wallet with 12 Hooks & 1 Keychain / Ring for Women and Men Black | What Should I Say? Many key cases only have 6 key hooks, that maybe enough for some people. But not enough for those people who has a lot of keys, and of course 1 or 2 car fobs. This new product, KC004, has large capacity. There are 12 key hooks, 6 on each side, you can put double keys to one hook if you needed. And, this key wallet also comes with 1 removable keychain, with 2 key rings. So you can clip 2 car key fobs on the chain. It is big enough to hold 1 big car fob or 2 small car fobs with full home keys in. This is a large key holder, so if you want a pocket key case, it is not good. It is design to attach to belt, there is a spring hook on the top. Or put it in ladies purse. Size: 4.8" x 3.0" x 1.0"
We devote to provide special design personal items, especially in leather product such as womens wallets, mens wallets, card cases, and various bags. All Aladin products have at least 3 months guarantee, some are longer. Thank you for choosing Aladin. Big enough to hold lots of home keys and 1 or 2 car key fobs. If you have any questions about this product by Aladin, contact us by completing and submitting the form below. If you are looking for a specif part number, please include it with your message.